Heaven knows we need restoration in this fractured, dispersed, and broken world. And that’s going to take us coming together as the Human Family. But wedges, mindsets, and worldviews keep driving us further apart. Faith, color, creed, neighborhood, income bracket, and dare I say: politics – you name it….we’ve defined it, labeled it, and judged it. In every area of life, we are versed at assessing people according to how similar they are (or believe) to us and building fences accordingly. What we need is unity. But that word has been thrown around so much; it doesn’t mean much anymore. In fact, its over-articulation and under-manifestation causes us to dismiss it altogether…. It seems like – in our world today – unity is either a utopian idea or a tamped-down behavior choice. Further, what does “unity” really mean, anyway? “Unity” is one of those words that takes on experiential definition….a word that is defined by each person’s experience. For some, unity conjures up happy plastic people holding hands and singing “kumbaya.” It can have a lofty and idealistic flavor: “wouldn’t it be nice if the world were in unity,” we fantasize. It connotes a utopian world where sanitized people are oblivious to the raw and troubled world surrounding them. For others, unity means “playing nice in the sandbox” with people who can sometimes be sand-slingers. Its connotation here is about “getting along” and even “damage control”. Unity, in this view, is a choice to make nice and keep the peace; helping instead of hurting others. And for the lucky few, unity means harmonious relationships and communities marked by togetherness in heart. As you reflect on YOUR experiences with unity, what have they been? Does unity seem plastic, peace-keeping, or possible? Last year I stumbled across the Greek word (often so much more robust than the English language can capture) for unity that rocked my world. In “one accord” means to be of one mind or of one passion. The Greek word for this oneness of mind and passion is HOMOTHYMADON. I know it’s a mouthful, but in this word lies the TRUE KEY to UNITY….. 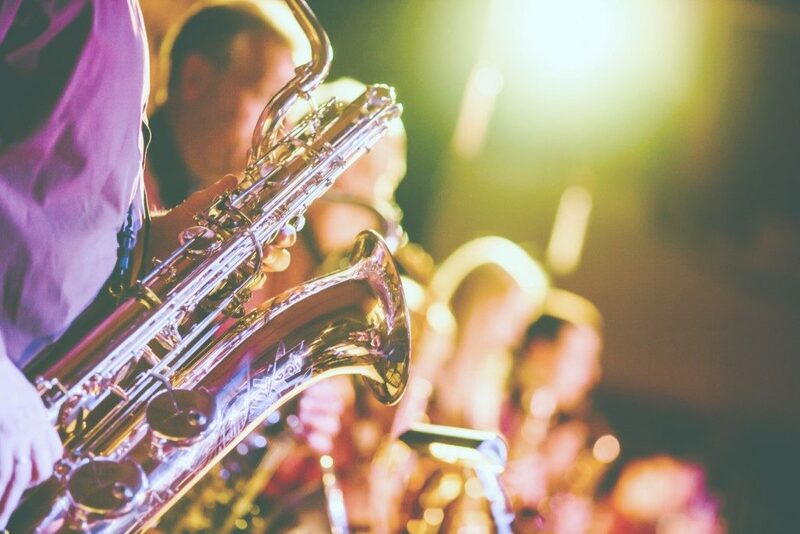 The word “unison” is musical in connotation, like a concert where a variety of instruments, each sounding their unique notes, harmonizes with one another. What if TRUE UNITY is neither a state of utopia or friendliness? What if it doesn’t have anything to do with us TRYING to get along? What if TRUE UNITY is a frequency??? TRUE UNITY (homothymadon) is when each of us begins to operate in the Original, Glorious Us! As we grow and mature and as we get clearer about who we were designed to be, we become a lovely, clear, pure SOUND….the sound that is OUR SOUND. The sound that the trumpets blew when we were born! As each unique person’s sound gets clearer and louder, this causes a crescendo in the music…a rushing along of this magical music. 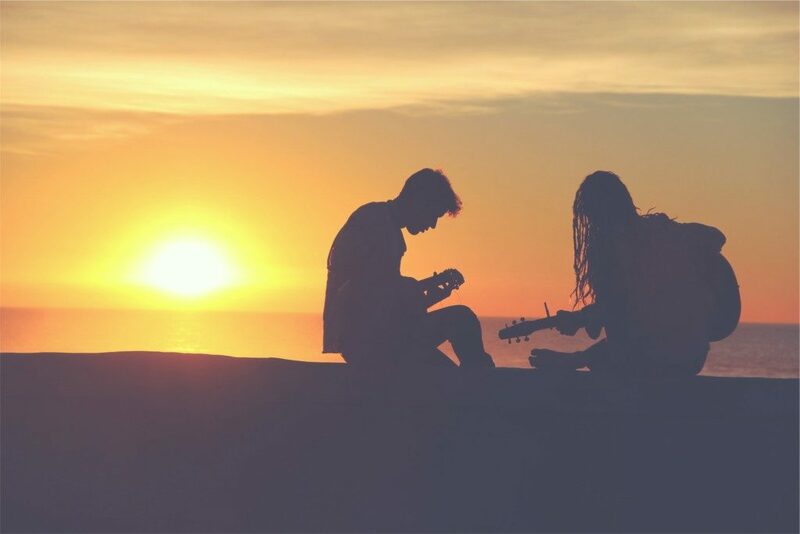 In everyday life, this means that as each of us become US – and quit trying to DO or BE something else – we begin to contribute our pure, intentional sound into a growing concert of awakened and clear people. As you are just doing YOU; you’re actually fulfilling your design and affecting your purpose on the earth. And as everyone else is doing THEM; they’re fulfilling what only THEY can do. As we’re each focused on being the solution to the world’s problems that ONLY WE can be, we’re the long-awaited, effective answer to the needs. Our individual sounds coming together begin to harmonize. 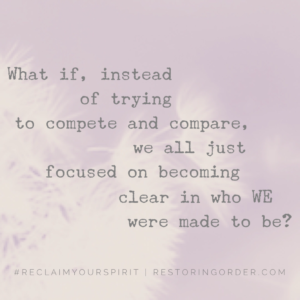 What if, instead of trying to compete and compare, we all just focused on becoming clear in who we were made to be? 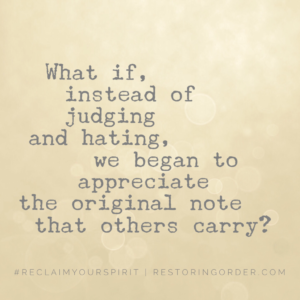 What if, instead of judging and hating, we began to appreciate the original note that others carry? As we strengthen our sound through our own wholeness and love for fellowman, we are fulfilling our intended part in a Master Concert playing heaven’s love song. The concert is comprised of unique and beautiful instruments of Love. A single sound can be glaring or tiresome when played independently…because we were never meant to “go it alone” in this life! Our unique sound actually sounds BETTER when joined with the sounds of others. It harmonizes and complements when blended as intended. Now, THAT is true unity!! Children’s nursery tunes tapped out on rudimentary piano keys don’t move the soul. It is well-constructed, divinely-inspired music that moves people to action. Those are songs you fall in love to. Songs that inspire hope for another day. Songs that rewind time to reminisce. 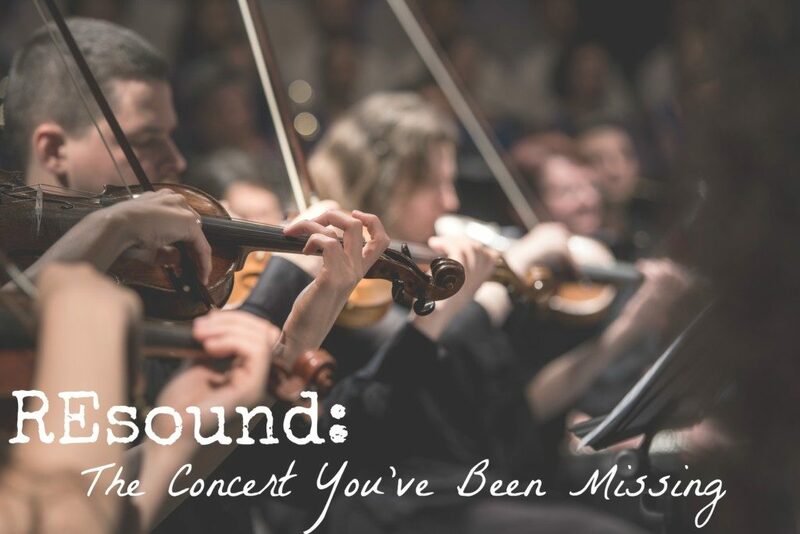 Songs that mend our hearts. Songs that rally troops and people groups and nations. 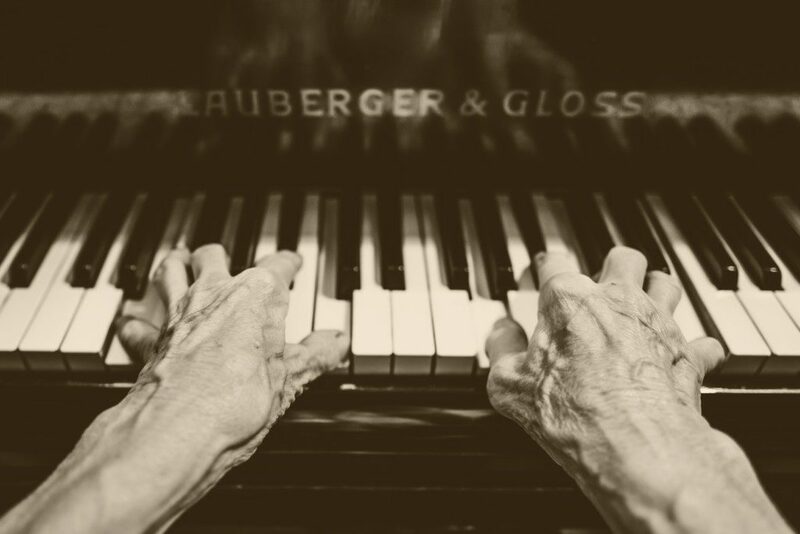 Music can outlast generations, making its way into memory, and thereby DNA. A single note cannot do that. A humble group of do-gooders trying to play nice together cannot do that. But coordinated, orchestrated, harmonizing MUSIC moves the world. Song – which is a compilation of sounds – accomplishes otherworldly tasks in hearts and minds that deeds cannot. And YOU are part of heaven’s song! Join me and my family in embracing homothymadon as our modus operandi. As you focus on your own wholeness and appreciation for the greatness hard-wired into others, you will step into homothymadon. And together, our beautiful, harmonizing, unified sound will help heal and restore the broken world. A great idea reflected in a very creative way! Thank you, Robin! I love to present a new lens on an old, unknown, or misunderstood concept. So, I’m thrilled that “homothymadon” has piqued your interest. Thanks for your comment and abundance to you! Woo Hoo! Thank you for once again calling out the symphony we are a part of. Thank you, dear Kelly, it is an honor to bring this heavenly message to earth! Lots of love to you and your family! Can’t wait to see you tonight!